Winter & The Wolves is Seattle-born rapper Grieves‘ fourth studio album, and instantly it shows a new maturity. There’s a more developed and explored sound plus a lot more variety than the artists last album, Together/Apart. 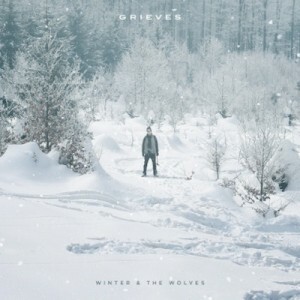 Grieves blends together hip-hop and alt-soul, mixing singing and rapping on top of songs built up with atmospheric layers of piano, synth and guitar. Right from the start of opening track “Rain Damage,” the album has a cinematic feel to it. Like an electronic orchestra – delicate but forceful – a combination of beating synths and harmonized eerie vocals give the chorus the dramatic boost needed to raise the track from good to great. Much like the album as a whole really. Following track “Whoa Is Me” starts of with a kooky (a little bit jazzy) beat that forms the backbone of the whole song, before breaking into a tongue-in-cheek rap that’s sarcastic, and at times purposefully discordant. Single “Shreds” is fast-paced and angry, made striking by layered harsh electronic beats and closing track “Smoke In The Night” is built on a gentle mournful piano rhythm, accompanied by slow heavy drums. It’s appropriate that this album should show a maturing of Grieves sound, seeing as he describes the album itself as a “reflection on growth and maturity” based around the idea of abandoning the dream of youth and finding a new path forward.